The human brain is built for bias. To efficiently process a large amount of information quickly, the brain creates categories and ties personal associations and perceptions to those categories. This process happens subconsciously and usually without malintent. Left unchecked, unconscious bias can have negative implications when it comes to the way companies hire. Even with the best intentions and the most experienced recruiters, unconscious bias can creep into the sourcing process, resulting in certain candidates gaining an advantage in the hiring process for the wrong reasons and thwarting opportunities for other candidates that may be the right fit for the job. 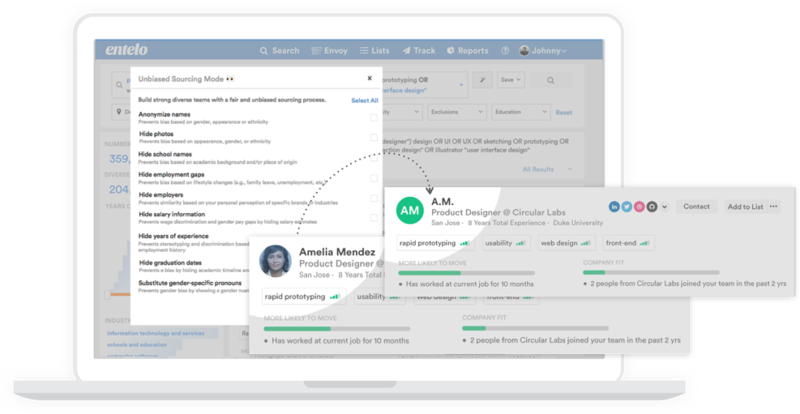 Today, we’re excited to announce a new feature, Unbiased Sourcing Mode, that is designed to help mitigate unconscious bias at the top of the recruiting funnel, to encourage an objective, fair and inclusive hiring process. Unconscious bias is a difficult problem to tackle for most organizations and an even more difficult thing to eradicate. To make headway on ridding bias from the hiring process for good, Unbiased Sourcing Mode, anonymizes and hides specific information from candidates’ profiles that have been known to cause bias. This feature is completely customizable and allows recruiters to anonymize features that they know may influence the way they feel about a candidate. These options help mitigate bias around age, race, gender, education and even family leave. The precise capability allows users to anonymize names and hide photos, school names, employment gaps, years of experience, graduation dates and replace gender-specific pronouns. Now recruiters can surface the best candidates for their needs while ensuring everyone receives a fair chance to work for their company. Utilizing this tool enables recruiters to build qualified candidate pools based on candidates’ accomplishments, skills and qualities while mitigating unconscious bias –helping both recruiting teams and hiring managers kick off the hiring process on the right foot and feel good about the way their companies hire.